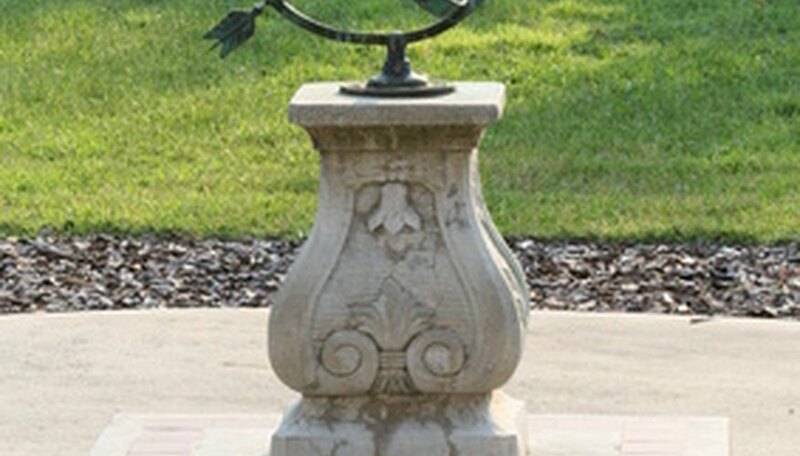 Traditional armillary sundials use a series of copper or metal strips shaped as a globe to display the time of day using only the sun's position. A shadow cast by an arrow in the center of the sundial, known as a gnomon, will land on the time of day. These sundials were typically made by skilled metalsmiths and still require a great amount of skill to properly reproduce. It is simple, however, to make your own simple, working model of an armillary sundial using only household items. Download and print out an hour circle. Use scissors to cut it out along the dark lines. Lay the hour circle face side down and cover with a long strip of tape, letting some extra hang over the bottom. Affix the hour circle along the edge of the CD insert with the Roman numerals facing inwards towards the center. Cut out two circles 3 cm in diameter from the construction paper. Tape the two circles on both sides of the center of the clear CD insert. Push the toothpick through the exact center. Open the jewel case with the hinge on the left side. Place the sundial assembly inside of the jewel case with the hour circle on the side opposite the hinges. Tilt the left side of the sundial assembly up, so that the jewel case's cover is resting on it. Determine what latitude your current location is and record it on a separate sheet of paper. Put the sundial on a flat surface and look at it head on. Place the protractor in front of the sundial and tilt the clear CD insert to adjust the toothpick's angle, as measured from the horizontal, so it roughly matches your location's latitude. The toothpick is the gnomon for this sundial. Tape the sundial in place. Put the sundial in a sunny spot, check the current time and adjust the position of the sundial until it reads the correct time. Your sundial is set and will now give you an accurate reading of the time. Depending on the time of year your clock may be a few minutes slow or fast. Check with the conversion chart provided by the Society of Popular Astronomy to ensure an accurate reading. What Is an 8 Day Clock?